1558: Twelve children, gifted far beyond their years, are banished by their Tudor queen to the town of Rotherweird. Some say they are the golden generation; some say the devil's spawn. But everyone knows they are something to be revered - and feared. 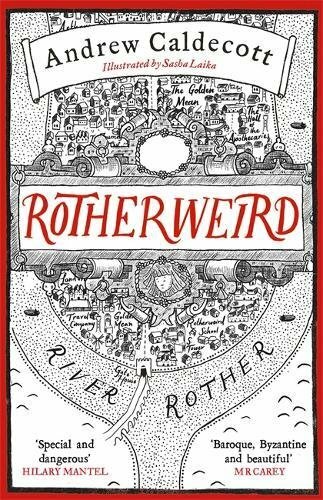 Four and a half centuries on, cast adrift from the rest of England by Elizabeth I and still bound by its ancient laws, Rotherweird's independence is subject to one disturbing condition: nobody, but nobody, studies the town or its history. Then an Outsider arrives, a man of unparallelled wealth and power, enough to buy the whole of Rotherweird - deeply buried secrets and all . . .
One for sorrow: Mary Tudor, a magpie queen - dress black, face chill white, pearls hanging in her hair like teardrops - stands in the pose of a woman with child, her right palm flat across her swollen belly. It is the charge that catches his eye: theft of a book by night (A Miscellanie of Peculiar Weapons), and the defendant's demeanour. The squat, ugly young man fences with the visiting judge, showing more wit than sense. SOURCE ... Purchased with a Waterstones book voucher. READ FOR A CHALLENGE? ... No. MY THOUGHTS ... A book I stood with in my hands for ages. Did I like the sound of it? Hmm! Perhaps but, then again, perhaps not. Attracted by the front cover and black edging (what's that about never judging a book, I hear you ask) Mr T kind of made my mind up for me, declaring that he'd quite like to read this himself. Oh well, it was on special offer; buy two, get one free. What I'd like to think of as the one I got for free, alas not not my kind of read; it turns out Rotherweird was something of a Ratherweird read. Fantasy fiction? Science Fiction? Historical fiction? A mystery? Whilst I don't necessarily find the need to label any book as being this, that or t' other, for me the main problem was here was a novel trying too hard to be too many things. Full of excessive descriptions and what I'm sure the author thought of as witty anagrams ... anagrams that I eventually didn't even take the time/lose sleep over wondering about let alone trying to work out. To be fair, as a reader more into characterisation than world building (though of course to have both is a bonus), whilst some of the characters names were fun (Sir Veronal Slickson, Jonah Oblong, Morval Seer, it seemed to me as if more attention had gone into these and the character's initial creation; any character development coming a poor second. With all the constant shifting of scene, jumping from one perspective to another, one could argue that this was a book written from the onset with 'Ooh! This would make a good film' in mind. You know the type of storytelling; based on solid story structure, faster paced, the emphasis being on creative visuals. ... And as for it being dubbed 'Harry Potter for grown-ups'? Those like Mr T who aren't fans of the boy wizard are likely to be put off by the comparison and, as for those who are fans of Harry and co? Well, I think they may be left disappointed. It is too bad that this was disappointing as the premise sounds fascinating. I do like world building but weak characters can wreck a book. I also like the cover. Sorry this one wasn't better. It sounded like it could have been good. Well.... despite your excellent review, I'm still left wondering if I'd like this one or not. Leaning more toward not, I think. But - great cover!! That alone would have had me picking up it. your honest and excellent review. Ooh sorry this wasn't a good one for you. Definitely sounds like it's a bit all over the place. Aw, thank you for sharing your real thoughts. I hope the next book you read is more to your liking.